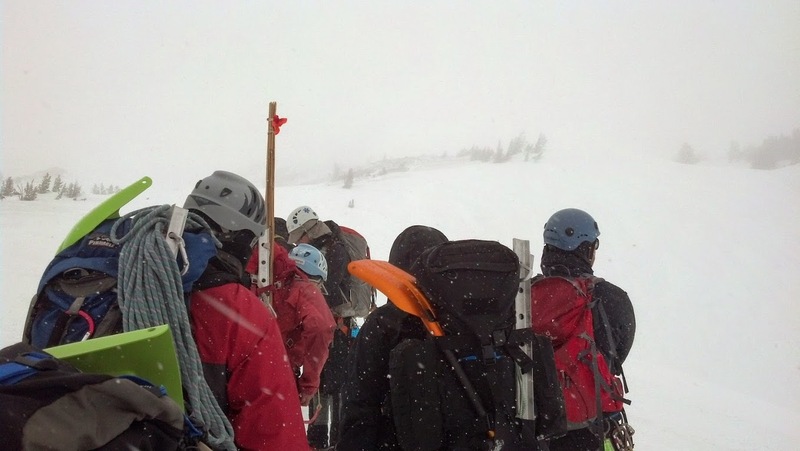 On Saturday May 3rd, 2014 we had a good time, and an enthusiastic team, for our intermediate Snow Skills Clinic on Mt Hood. 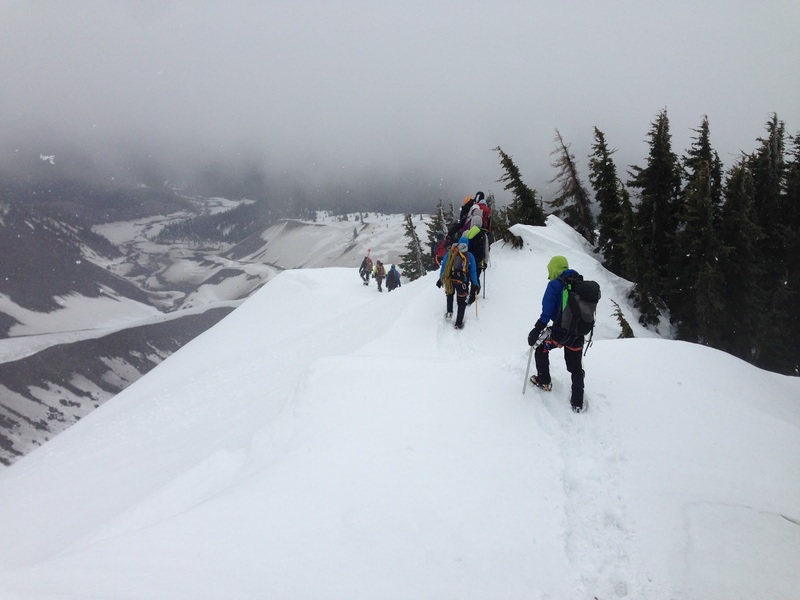 This was an opportunity for climbers of all levels to test and improve their fitness and add to their snow climbing skills. With light snow falling all day we had a chance to do some avalanche assessment, belaying, and escaping belays, off an anchor, z-pulley rescues and (for the newer climbers) some exposure to crampon use. 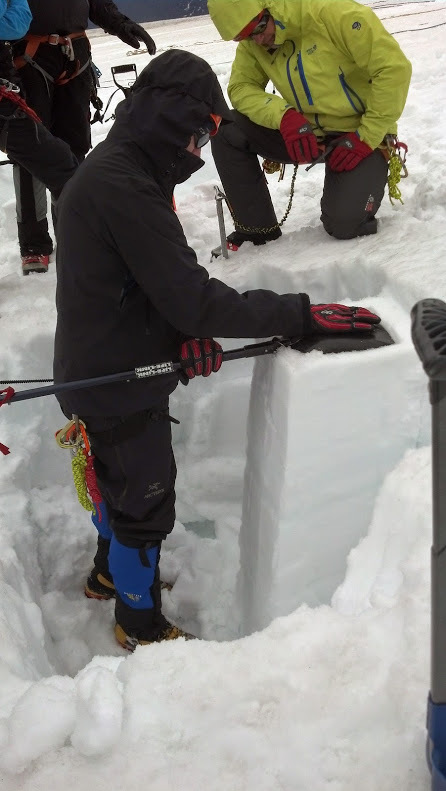 Adding to the educational opportunities... both Chris and Mike Rudy punched through the snow into a small crevasse. Hiking out- white river canyon below us. 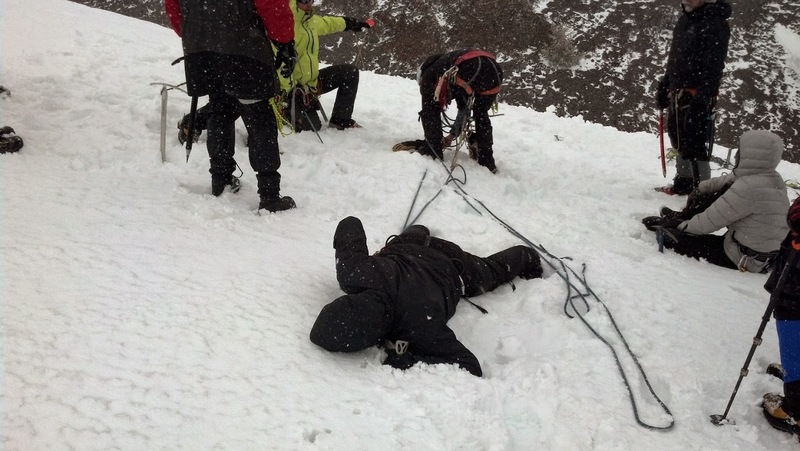 For the recent climb school students with little snow experience this will be an opportunity to practice being an effective member of a roped team on snow/glacier. 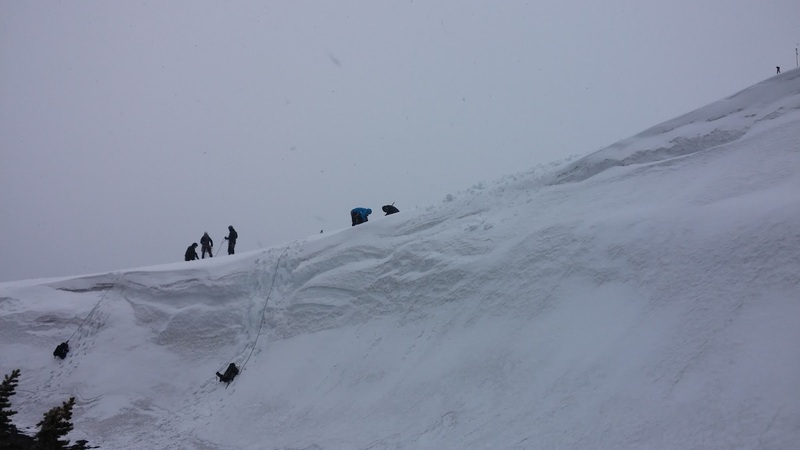 This includes: being able to efficiently tie into the rope system, move confidently on steep snow using crampons and ice axe, clip efficiently through snow anchors and self-rescue after a fall into a crevasse. For the more experienced climbers and assistants this is an opportunity to set up and lead a rope team, belay off of an anchor to bring the team up to your location on steep terrain, and set up and execute a rescue using a z pulley system (for this later skill we will be looking at managing the rescue scene and teamwork - not just the mechanics of building a z-pulley). 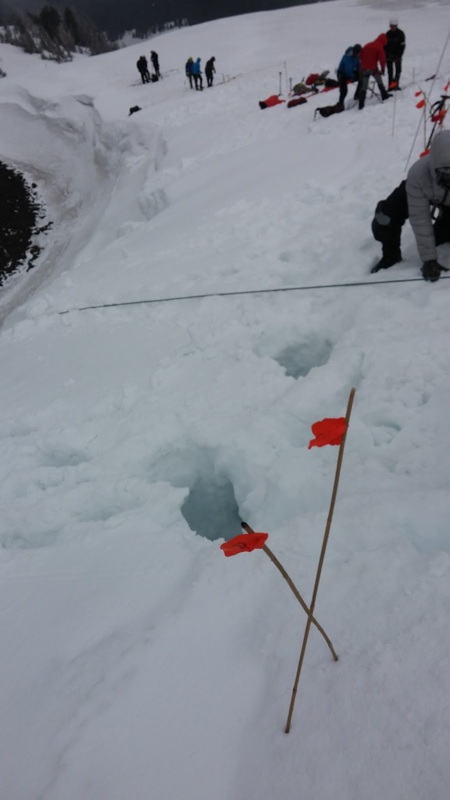 Given the recent avalanche conditions we will definitely be digging snow pits and doing avalanche assessment. 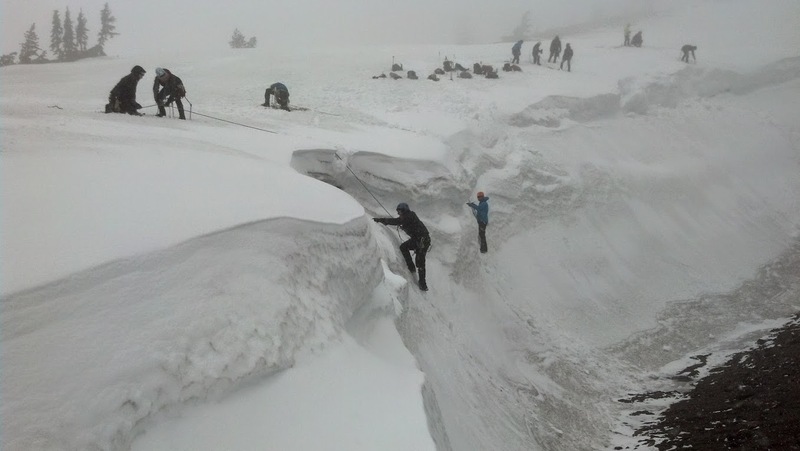 We will be getting into steep snow conditions for this outing. 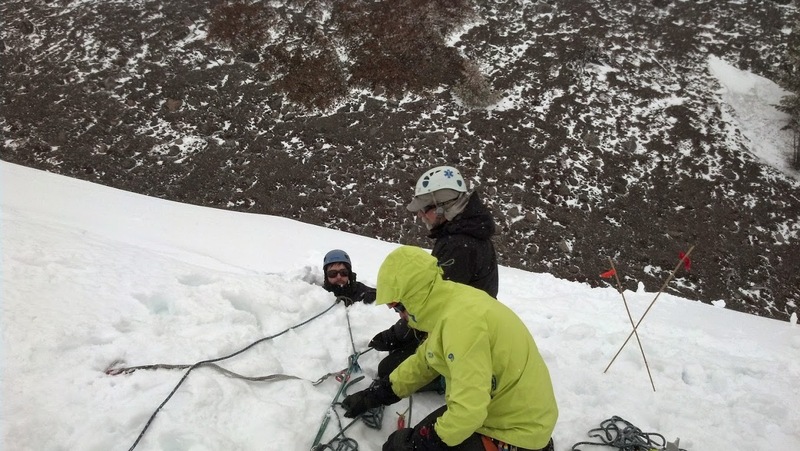 Ice axe, harness, helmet and crampons (fitted to your boots ahead of time) are required. Crampon compatible boots and gators. Sunglasses are also required. I recommend that you pack as you would for a Mt Hood Climb. this will be a good chance to test your gear and food/water options out. Prussik cords are required. Pulleys and shovels will be helpful if you have them. I'd like to have one shovel per rope team. 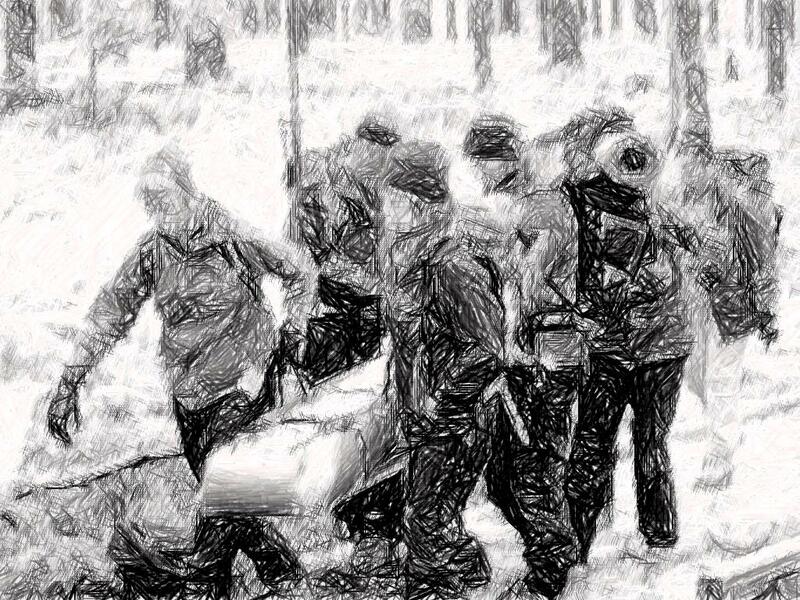 Please have your gear together and be prepared to carry some group gear (ropes, shovels, etc.) Its best to have a larger pack and have some external straps for lasing down a rope and strapping on an ice axe (i.e., don't come with a small textbook type daypack. I've got nothing against Care Bears but their equipment line rarely includes ice axe loops.) We will be getting into the snow so a waterproof outer shell layer is important and an extra set of gloves to swap out when your first pair gets wet. See Gear List #4. Bring plenty of water (at least 2-3 liters) and food as we won't be returning to the cars during the day. 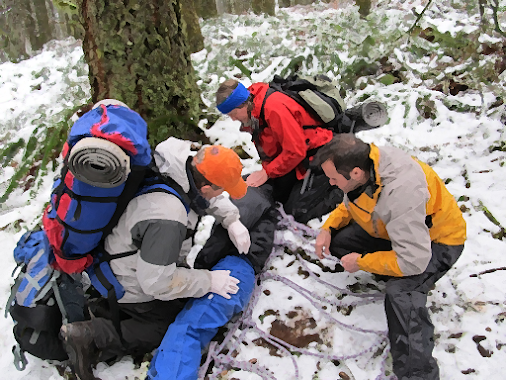 Leader will be carrying SPOT beacon, hypowrap materials, first aid kit and cell phone 503-910-9726. We will head NE out of the parking lot and about 1000ft vertical to seek some suitable steep terrain on the edge of the white river canyon. State Motor Pool in Salem - This will be the best option for folks in Salem or points south. So far I haven't heard from anyone who is meeting at this location yet. Chris, Eric, Michael G, and Mike P are carpooling from Salem. Chemeketa Brooks Campus - Looks like everyone will be meeting in Brooks at 6:30. Location is 4910 Brooklake Rd. NE Brooks, Oregon 97305 -Take exit 263 toward Brooks. Turn right onto Brooklake Rd NE and go about 1/2 mile, Campus is on the right - enter between Campus building and Fire Station and park in the back of the main Campus building. 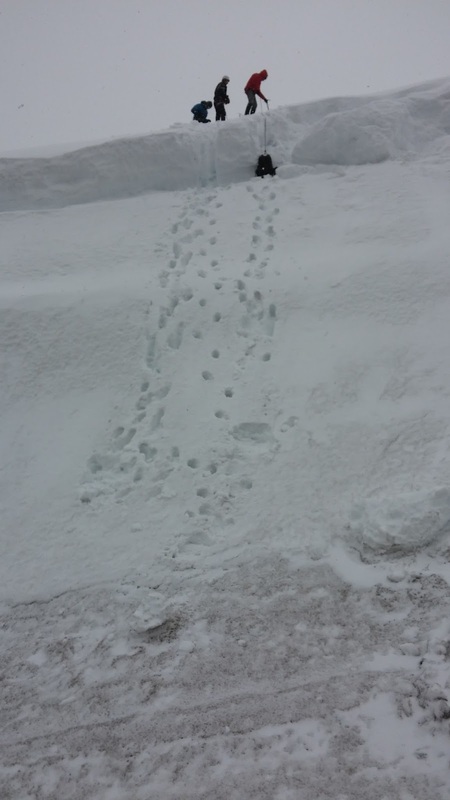 1) Assess snow conditions upon arrival to determine if we are able to get in some crampon practice or not. 2) Group assembles at the end of the "climbers" parking lot: Assign teams; Issue group gear: Pickets (1 per person) shovels (1 per team), ropes (1 x 50meter half-rope per team). Leaders check teams gear (harness on correctly?, no sharp things swinging off of the packs, everyone has sunglasses, has put on sunblock, etc) FRS radios to Channel 10 Code 5. 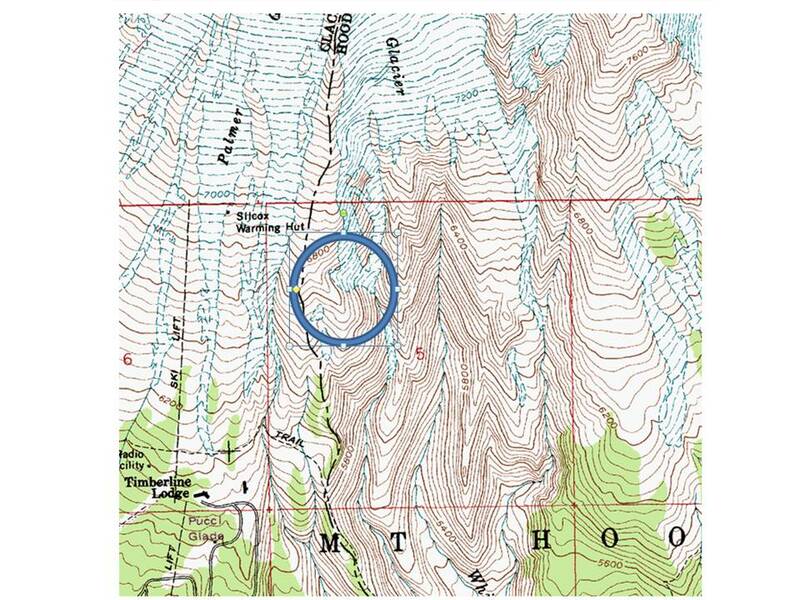 3) If conditions are suitable well start out with crampon technique and, if conditions warrant, start hiking to our practice area. 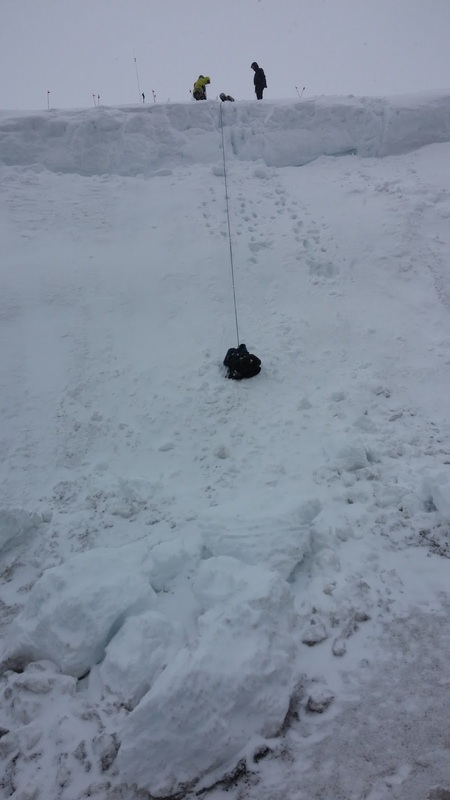 4) Once in our practice area we will do snow pit tests to access avalanche conditions. I have a snow saw and various snow assessment tools. We will be doing the compression test after digging out and isolating a snow column and also assessing the hardness of the snow layers. 7) Belaying on steep snow: The goal of this exercise is For the recent climb school students be able to belay the leader on steep snow. 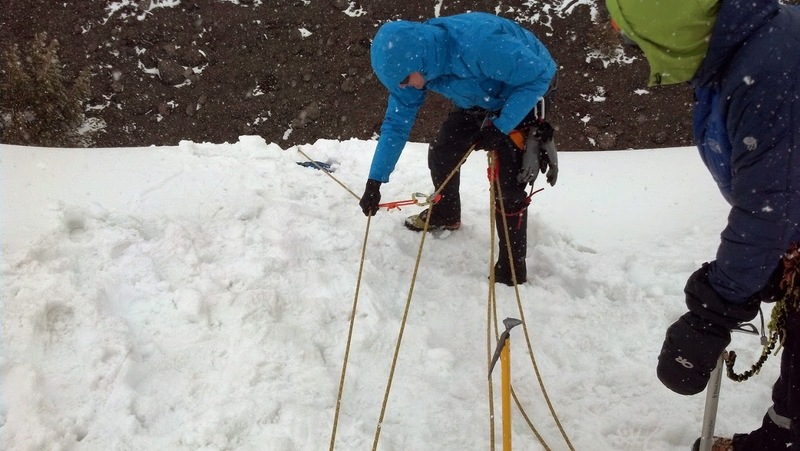 For the more experienced climbers and assistants this is a chance to practice establishing and belaying off of anchors on steep snow and, as time allows, escaping the belay using a Munter-Mule. This will be a full day on the snow I expect we will be wrapping up and back to the Timberline parking lot about 3 pm or so.